For a very long time, I have always been travelling with my Longchamp Le Pilage as hand luggage. Being someone who is petite and a light traveler, I dislike having to struggle with any heavy hand-carry into the overhead compartment; thus, I much prefer durable bags I can squeeze under the seats. Well that was until my recent Hokkaido trip where my parents reminded me the need to have my bulky winter coat and random accessories the moment we land in snow paradise, that I decided the need to upsize to Kipling Art M! Other than the wide shoulder straps that makes it comfortable to be carried all day, I love how the bag is as light (if not lighter) as my Longchamp despite its massive size, durable material that’s waterproof yet flexible enough to squeeze beneath the plane’s seat… I’m in luck! I picked this print instead of the usual colorful designs simply because I prefer my bags to be versatile enough to match my clothes, and when it gets too heavy, it won’t emasculate my husband when I offload it to him 😡 I also love the spacious interior and various compartments for easy finding – makes shopping a breeze! 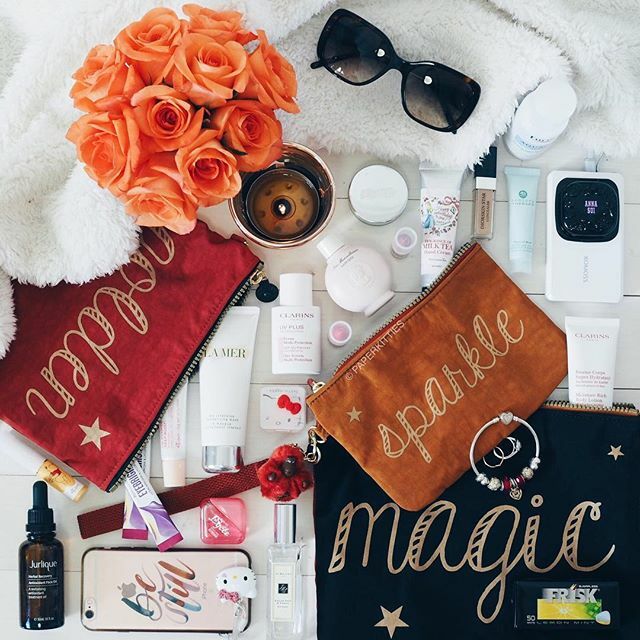 That being said, I do love bringing around my Kipling Lara L Wristlet trio whenever I travel to pack all my random must-haves! I like to allocate them into 3 sections: sweets & meds (small), beauty (medium), gadgets (large); makes life so much easier when I’m digging around my bag for them. Of course, Kipling Art M not only makes a perfect plane ride companion, it is also ideal for weekend escapades. I recently brought it to my staycation at The Club, fully loaded with all my beauty products to snap away and of course, lush bombs for a bubble bath! My husband was so surprised at the amount of stuff I was able to squeeze into (his snacks included) and still have so much space. LOL. That should of course be credited to extendable zippers at the corners that allow me to change up the silhouette for extra space.